I hope there’s a special place in Hell for people who abandon pets and hurt animals. I was walking around Corinthian Gardens Village earlier this evening and found a sweet cat. 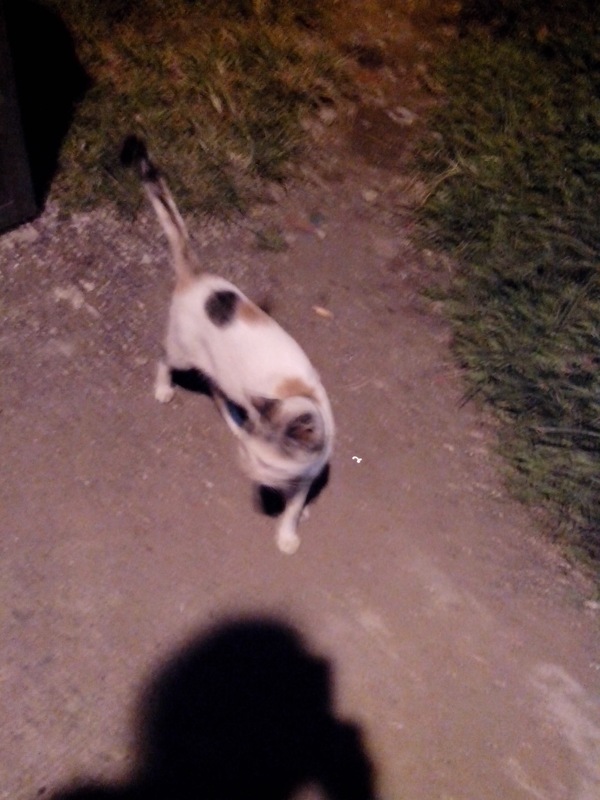 She meowed as I passed by her, she approached me, and then started rubbing her head on my pants. She looked up and gave me another meow. I noticed right away that she was wearing a collar with a bell but no tag. I played with her for a while so I could check her condition. She was dirty but healthy. We were a block away from the EDSA entrance of the village; we walked over and I talked to the guards. Apparently she was abandoned 2 months ago (she looks like she’s 6 months old) and they’ve been taking care of her ever since. They have been taking turns feeding her and making sure that she’s inside the guard house when it starts raining. I promised them that I would come back and have her spayed. I don’t want her getting pregnant and having stray kittens. I got extremely upset and angry when I saw her collar. How could people just abandon their pets!!! My anger dissipated, though, after I spoke with the guards. Bless them. I hope there’s a special place in Heaven for people who help abandoned pets and take care of animals.